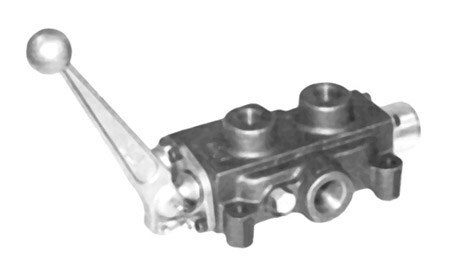 Hydraulic Control Valve Converta Series | Cross Mfg. The Cross CV (Converta) series hydraulic valve is a highly versatile 3-way or 4-way, 3 position directional control valve for use with either double-acting or single-acting hydraulic cylinders. The Cross Converta can be easily converted to a 3-way valve by using the conversion and port pipe plug supplied with the valve. It can also be converted to a 3-position manual detent valve by ordering a separate detent kit: part #1V0294. This valve may be used to operate a double or single acting cylinder, or a reversible or single direction motor when a hold position in neutral is required. Not intended for use in metered lifting circuits. Not convertible to pressure kick out. Never use a manual detent in a logsplitter application.